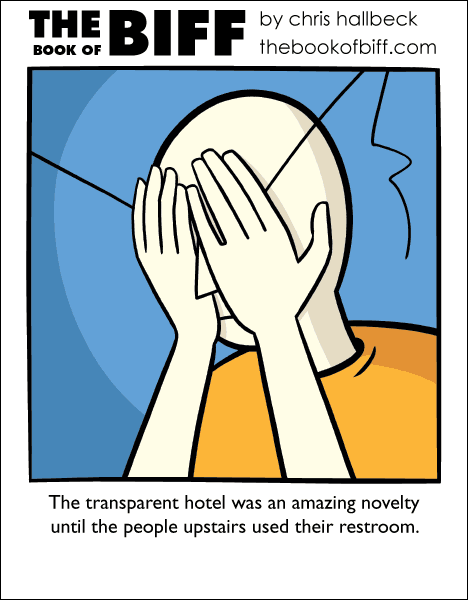 Usually you only hear things you don’t want to hear at a hotel. Seeing things you don’t want to see would be much worse. Of course there would be a few people that would really enjoy it. Like the designers of the hotel. This brings up the eternal question: How exactly certain invisibility-powers work. In this case, what happens when the, uh, excrement leaves the person’s body and lands in the toilet? Does it eventually disappear when it reaches the pipes, or what? Similarly, if an invisible person eats something, and you can see them chew their food and it go down their throat, does that mean you can see blobs of food floating in their stomach under their shirt? And does that mean you’ll be able to see as it is slowly dissolved by invisible stomach acid and pushed through invisible intestines? Perhaps I think too hard about this kind of thing. I always thought of it like bending light around you, or maybe like a camera and display, or something. So if you were invisible, people saw around you instead of through you. So, they wouldn’t see the food in your mouth or digestive tract, but once you pooped it out, it would be visible in the toilet. Also, if said invisible person was wearing a shirt, you would see the shirt. In the novel We by Evgeny Zamyatin, all citizens of a totalitarian state lived in transparent apartment buildings, so that the secret service could keep an eye on everybody. I don’t remember how the bathrooms worked in that system. Yesterday, on another website, there was an article linked about a bathroom built above a abandoned elevator shaft. The guy who installed it made the floor out of thick glass with metal reinforcements, so you can look straight down into an abyss. That’ll scare the poop out of anybody.